I am publicly airing the shameful state of my "home office". Yikes! Maybe this will motivate me to make some positive changes! See Resolution #2. It’s never to soon to start that mental list of what you’re going to do differently next year. I always think of way too many things I must accomplish to better myself and I rarely check them off the list. This year I plan to keep it simple, and doable. Here’s a run down of my resolutions and a coordinating action plan for each one. 1. Clean the bathroom every week (including the tub and toilet!) I’m always so disgusted with how quickly the soap scum builds up and embarrassed by how long I leave it before I spend an hour scrubbing it out! ACTION PLAN: Assemble all cleaning supplies in a cute little caddy so everything is on hand and ready to go when I am! 2. Finally, finally conquer the mail pile up that clutters the kitchen counter. Sounds deceivingly simple, but this is a big one. As much as I like to declare that I am an organized person, there is much room for improvement. Try as I might, I have never been able to come up with a good way of dealing with paper clutter. ACTION PLAN: This is a multi-step resolution. First I’ve got to set up a new system for filing and dealing with the mail. Then I have to actually maintain the system on a daily basis. 3. Blog three to four times a week. I’ve got pages and pages of ideas for posts, but never seem to carve out the time to write them! ACTION PLAN: Get posts ready to go at night after Thomas is in bed. For this, I will have to give up some of the already limited television watching I do. That’s it. Just three, but three big ones. They are all ongoing challenges too. I can’t just check them off the list and move on to the next one. I’ve got to look at each of them as a function of time management, not just tasks on a list. I think if I can do that, I’ll sail through 2012, whatever it may bring, just a little easier! Betsy, I like your Blog today. All good sugggestions. Need to follow them myself. Thanks, I hope I can actually stick to them! Seriously? 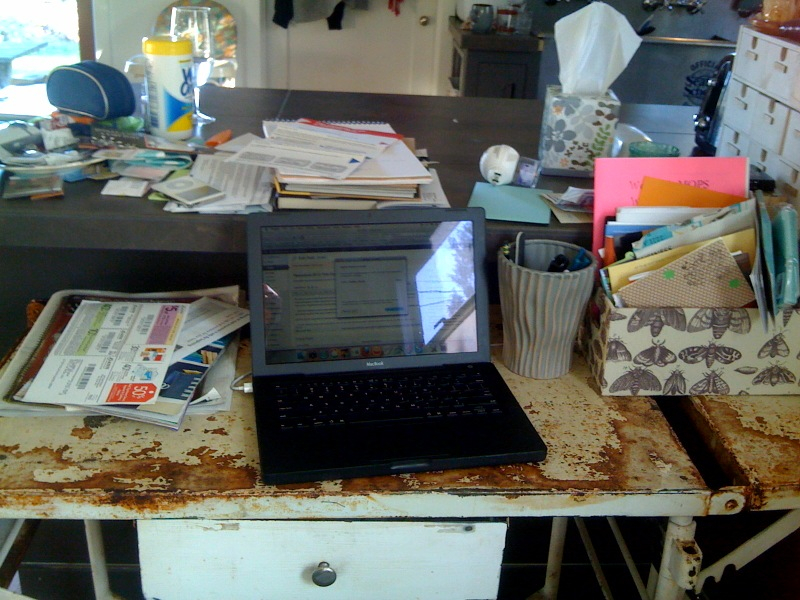 What is all that clutter on your desk? I would never have thought! Have you gone on a bender or What? I personally would never stand for that mess! Oh, I was just emulating a certain boss from my past, that’s all! I learned more bad habits than good from you Bobby!